VIENTIANE — At least two people are confirmed dead as of 4:30 p.m. local time (0930 GMT) on Tuesday, and a number of villagers are still missing after an under-construction dam collapsed causing flash flood in southern Laos, state-run online newspaper Vientiane Times quoted a senior provincial official as saying. The Xepian-Xe Nam Noy hydropower dam collapsed on Monday night. Video clips and photos on social media showed flood-water levels going up to the ceiling, forcing villagers and animals to seek shelter on rooftops. “Villagers have sought shelter on their roofs, and some climbed up trees to escape the flood waters,” an official of the provincial rescue operation board said on condition of anonymity. Helicopters and boats have been deployed for the rescue operation to search for the missing, district governor Bounhome Phommasane told Vientiane Times on Tuesday. Some people have been rescued and are sheltering at the facilities of the district’s main municipality. Rescuers are battling with time as the water level is poised to rise, the governor said, adding that the number of affected villages are likely to grow. Moderate and heavy rains with strong winds are forecast for some areas in central and southern provinces in the coming days, which could worsen the situation, the Lao Meteorology and Hydrology Department warned. 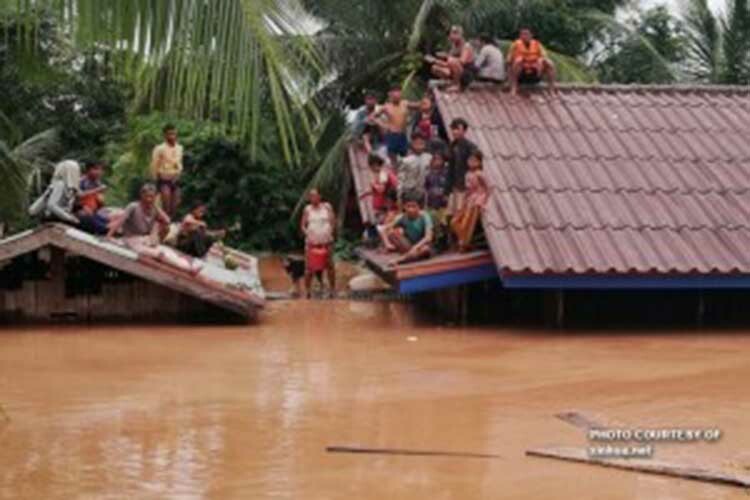 The Lao government declared the flooded area an emergency disaster zone on Tuesday. Prime Minister Thongloun Sisoulith suspended the planned government meeting and rushed to Sanamxay to monitor rescue and relief efforts for victims. The cabinet has entrusted the Ministry of Labor and Social Welfare in collaboration with the Ministry of National Defence and Attapeu provincial authorities to urgently appoint an Ad Hoc Committee to mobilize aid and relief supplies to help the victims. The collapse of the Xepian-Xe Nam Noy hydropower dam caused flash flooding in six villages of Sanamxay district including Yai Thae, Hinlad, Mai, Thasengchan, Tha Hin, and Samong. Hinlad and Mai villages were hard hit, according to Lao News Agency (KPL). The under-construction dam collapsed at 8 p.m. local time (1300 GMT) on Monday, releasing 5 billion cubic meters of water in hours. The Attapeu Provincial Administration Office has announced relief aid for flood victims. Being constructed by Xe Pian-Xe Namnoy Power Company (PNPC), a joint venture of South Korean, Thai and Lao companies, the Xe Pian-Xe Namnoy hydroelectric power project is estimated to coast USD1.02 billion, and to have an annual electricity generation of approximately 1,860 GWh.